It's not quite 20, but it doesn't look a day over 90. 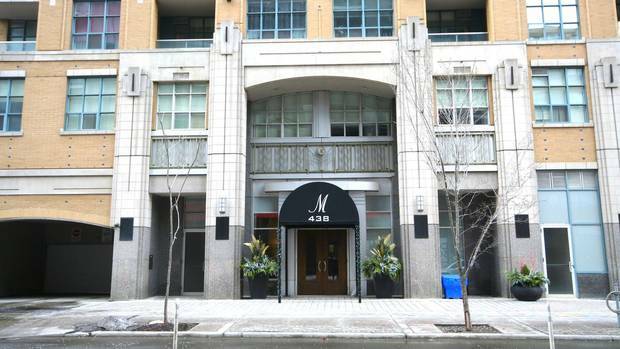 That's because the Morgan condominium, which was designed in 1998, was all about context. And Spadina Avenue, south of Queen Street, has a great deal of that, and most of it vintage. "I guess you could say some contexts are stronger than others," says developer Gary Switzer, who now heads up MOD Developments, but, two decades ago, was executive vice-president of Great Gulf Homes, builder of the Morgan. "My inspiration really was the surrounding buildings, like the Fashion Building, the Balfour, the Tower Building." Looking east down Richmond Street at Spadina Avenue. The Morgan sits on the right. Built between 1925 and 1935, those "needle trade" warehouse/loft buildings – many by Benjamin Brown, the city's first registered Jewish architect – were distinctive for being sturdy, well-proportioned, brick, and, although economical, adorned selectively with the latest Art Deco detailing. Mr. Switzer also remembers sitting down with architects Sheldon Levitt and Les Klein, then and now with Quadrangle, and thumbing through the book New York 1930 by Robert A.M. Stern. 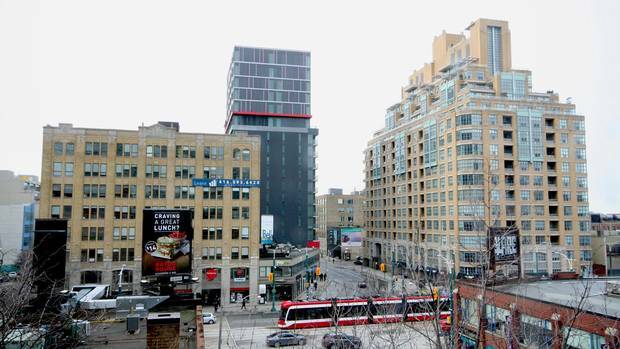 Each was excited by the possibilities opened up by new planning and zoning requirements for "the Kings"; in April 1996, under the leadership of then-mayor Barbara Hall, the heavy industrial areas at both King and Parliament and King and Spadina – the "shoulders" on either side of the financial district – had now become "regeneration areas" that allowed multistorey residential buildings, among other things. "We were getting the densities on this site that, just a few years before, were not imaginable," Mr. Levitt says, "and I think everybody – when I say everybody I mean the client and the city and certainly us – just believed passionately in the importance of doing a really good building." The brickwork of The Morgan’s exterior keeps the eye interested. And it is really good. On a recent walkabout with Mr. Levitt and Andrew Cassils, president of the Morgan's board of directors (and former Quadrangle employee who worked on the building), I found it difficult to remember what had occupied the wide, northwest corner of Spadina and Richmond before the ground was broken for the building – that's how well the 16-storey Morgan fits in. In a telephone conversation, Mr. Switzer reminded me it was a one-storey bridal store and, way back, a gas station. The bricks – the same yellow as the Fashion Building across the street – keep the eye interested, since they don't follow the usual running bond pattern; rather, some have been halved and, for punctuation, black "ironspot" bricks have been inserted into the mix on their ends. The outer edge of each pier has been traced with glazed brick for added effect. Shopfronts in granite at The Morgan. "It was such a unique brick layout that we had actually detailed, with dimensions, how the coursing was supposed to go," says Mr. Cassils. "And the masons pushed back quite heavily because they said 'you didn't price it to do it that way'… we dug our heels in on that because it was very important to the aesthetic of the building." And rather than carrying the brick right down to the street, a "kick plate" of rich granite rises up from the sidewalk, ensuring clean, un-salt-stained storefronts will always greet passersby. 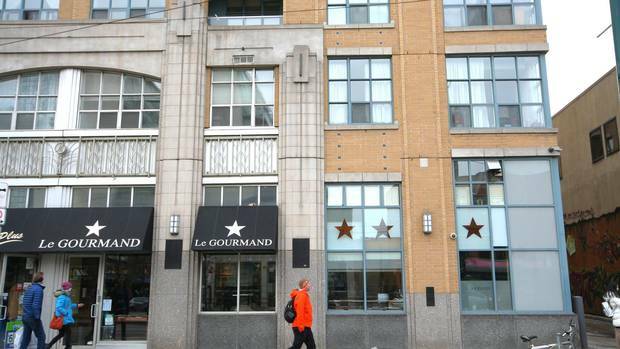 And about that: realizing retailers would benefit from the visibility of a Spadina address or the first hundred feet of Richmond, the condominium entrance was tucked as far west as possible. 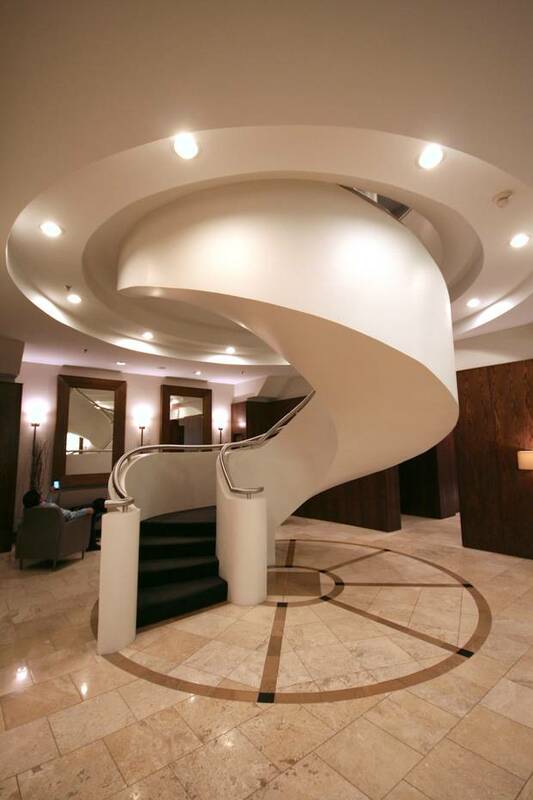 The curved staircase inside the lobby of The Morgan. Inside that entrance, I watched the noisy hustle and bustle of owners, dog-walkers and delivery people swirl around the poured-in-place, curved concrete stair as the very Deco-looking sculpture of Ulysses struggled to break away from those nasty Sirens. We toured the second-floor amenities – lounge, dining room, an expanded gym, saunas, media room – before taking the elevator to the 11th floor so we could climb the five flights enclosed in the very distinctive east stair tower, which Mr. Levitt calls "a really significant part of creating that top to the building." 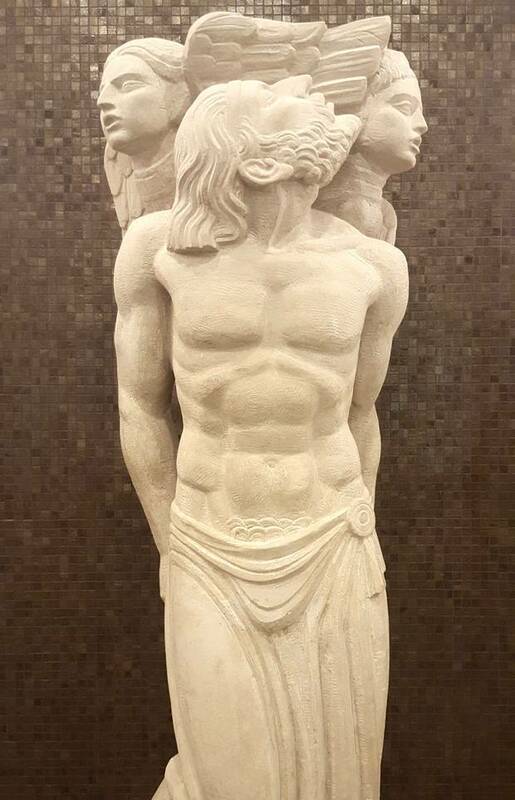 The Ulysses sculpture in the lobby of The Morgan. 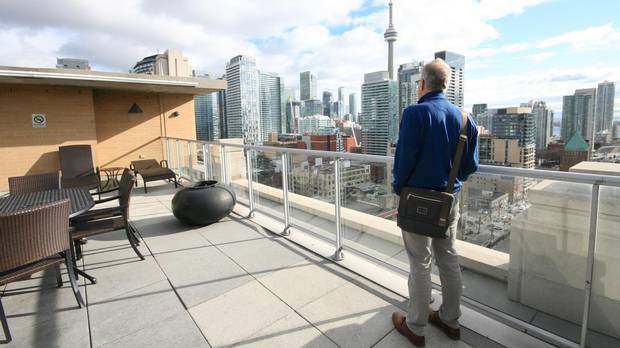 Up on the roof deck – "It's a fun place to be during the Air Show," offers Mr. Cassils – we're able to easily pick out the many brick schmatta buildings against the backdrop of new, silvery condo towers. We muse that, unfortunately, owners in those buildings don't enjoy the same unit sizes as those at the 217-suite Morgan: While there are some 600 square-foot bachelor units, most here average 1,000 square feet, with many much larger, such as the two-storey units at the very top of the building. "Probably, if this [building] was being done today it would be a 350-plus unit building," Mr. Levitt says. Architect Sheldon Levitt on the roof at The Morgan. That the building steps back so dramatically (which gives it that classic, 1920s/30s pyramidal shape) allows for multiple terraces and that dramatic stair tower. But that shape almost didn't happen, says Mr. Switzer: although zoning restrictions had been loosened considerably, odd rules about required heights and angular planes were still on the books, so the plan was rejected by council. When the team came back with the argument that even the beloved 1920s Benjamin Brown buildings wouldn't be allowed under those rules, permission was granted by the committee of adjustment. Good thing: That roof and east stair tower, now a local landmark, can be seen from almost a kilometer away at McCaul St. and Queen. 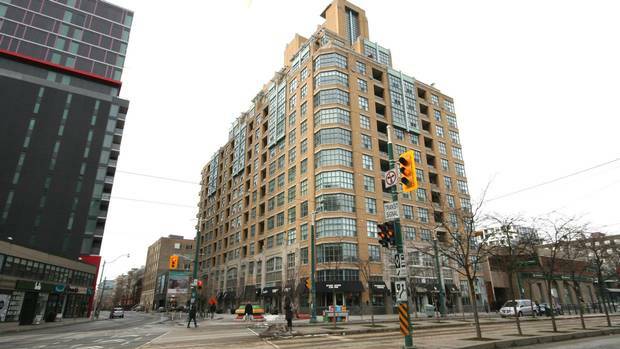 In 2005, citing its "good neighbourliness" and how it preserved "the scale and context of the streetscape," the Morgan was given an Award of Excellence by the Ontario Association of Architects. "I think it really completed that corner," Mr. Switzer says. "If we had just done a glass box and just ignored the whole context of those wonderful buildings south of Queen, I think it would have been a shame."